As she prepares to leave the White House, first lady and self-titled “mom-in-chief” Michelle Obama remains popular. Indeed, Obama was one of Hillary Clinton’s most powerful advocates during Clinton’s historic but ultimately unsuccessful presidential campaign. From Obama’s speech at the 2016 Democratic National Convention to her rebuke of Donald Trump’s lewd comments about women, Obama urged the country to “go high” for the sake of our children. Assuming a maternal role is not unusual for a first lady. It also is not unusual for women to couch their public activism in maternal terms. From Sen. Patty Murray, “the soccer mom in tennis shoes,” to former Republican vice presidential candidate Sarah Palin’s “Mama Grizzlies,” women frequently have appealed to motherhood as a means of gaining credibility in the public sphere. Yet Obama’s choice to highlight maternity was not always well received. When Obama first assumed the title “mom-in-chief” white feminists grumbled. As Obama continued to highlight her maternity, they claimed that Obama was belittling the significance of her professional accomplishments as an attorney and vice president of University of Chicago hospitals. Black feminists rejected these critiques. They argued that Obama’s embrace of maternity had progressive potential for the African-American community. As a professor of communication studies who focuses on motherhood, I believe these responses illustrate the complex nature of contemporary assumptions about motherhood. I also believe that they shed light on the opportunities and challenges of grounding politics in maternal appeals. White feminists who disliked Obama’s choice to highlight maternity were not rejecting motherhood. Rather, I believe they were resisting the assumption that motherhood is always a woman’s central concern. White feminists also were rejecting common and unsustainable assumptions about what it means to be a “good” mom. One is that a mother is the only suitable caregiver for her children. Another is that she must provide 24/7 care. And, a mother is expected to always put her children’s needs ahead of her own. These notions, sometimes referred to as “intensive motherhood,” leave little room for women to focus on careers, activities or commitments outside of caring for children. Echoes of intensive motherhood were frequently heard in Michelle Obama’s public comments. This was true of the speeches she gave at the Democratic National Conventions. 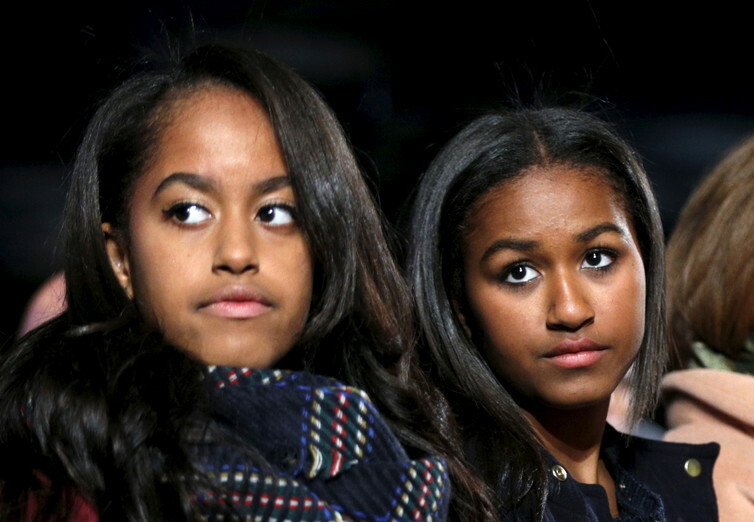 Malia (l) and Sasha Obama on Dec. 3, 2015. In these speeches, Obama also appealed to her concern for the nation’s children as the basis for her political priorities. She even extended that basis to the president. Throughout her time in the White House, maternity has been at the center of Obama’s public and private life. As first lady, Obama stands as the symbol of American womanhood. By prioritizing maternity, Obama reinforced the assumption that motherhood is a woman’s most important role. While white feminists worried about the sexist implications of Obama’s maternal stance, black feminists pointed out that African-American women have rarely had the opportunity to prioritize motherhood. Economic necessity has meant that generations of black women have had to work outside the home. Black feminists also noted that positive images of black mothers are largely absent in popular culture. Thus, when Michelle Obama prioritized the well-being of her African-American daughters, she rejected the negative stereotypes attached to black motherhood. Obama’s prioritization of motherhood, including her concern for the nation’s children, can be seen part of the African-American tradition of “othermothering.” According to Patricia Hill Collins, othermothering is a practice through which black women assume responsibility for children who are not their own. Black women who serve as othermothers understand their work as extending beyond the community’s children. They see their work in relation to the welfare of the community as a whole. Additionally, in black communities, the family serves as an important refuge for African-Americans living in a racist world. It serves a political function, allowing black women to nurture and protect their families and themselves. When Obama prioritized the well-being of her daughters while also extending her maternal concern to the children of the nation, she appealed to a politicized version of motherhood grounded in an African-American tradition of community care. As Obama’s tenure as first lady comes to an end, white feminists’ critiques of Obama’s maternal persona have quieted. Perhaps this is simply a sign of respect, or of not wanting to criticize a popular first lady at the end of her term. Or perhaps, it is a sign that Obama has brought an African-American understanding of motherhood to a wider audience, shifting the meaning of motherhood on the public stage. It is a vision of motherhood Hillary Clinton clearly appreciated and embraced. We will not get to see whether this mother and grandmother would have echoed Michelle Obama’s maternal stance during her presidency. Nonetheless, as we move forward, we can anticipate that women will continue to appeal to motherhood on the public stage and that the meanings of those appeals will have been profoundly affected by Michelle Obama’s eight years as our first lady and mom-in-chief.